This is the desire of the founders of The Cradle Project. Its an art installation project designed to raise awareness of the plight of children orphaned in Africa. 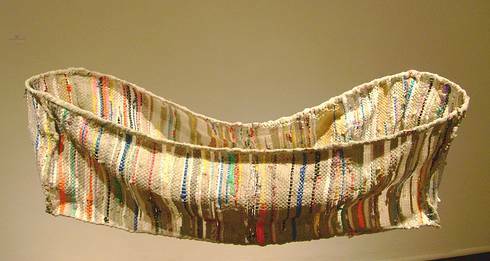 Basically visual artists create cradles out of found materials and the artwork is displayed for public viewing as well as at on online auction site. After the pieces are auctioned, the proceeds are donated to partner organizations who work directly with orphans thoughout sub-saharan Africa. Artists of all ages from around the world are welcome to participate. There is a wonderful ministry which was started by Tom’s Shoes. Their commitment is to match every pair of shoes purchased with a donation to a child in need. Our church did this at Christmas. Basically everyone who participated purchased a pair of the white canvas shoes and painted or designed them. The purchased shoes were then donated to needy children, and the bonus was that Tom’s shoes matched our donation! This is a great ministry for churches, local Christian groups, art groups or anyone who has a heart for the needy. You can design the shoes in any way you choose. Let your creativity flow, then donate the shoes to shelters, orphanages or if your church is going on a missions trip send a few pairs with them so they can donate them to needy children in other countries. This is an awesome idea for visual art ministry and better yet a great way for artists to help in sharing the gospel. One day I was searching the internet for an art ministry and I couldn't find a list of them. So, by the grace of God, I decided to create one! And this is it! This blog list programs that visual artists can participate in and use our talents to help others! Look through the list! Lots for groups too! What’s Your Visual Arts Ministry Vision? sandy Wisecup on What’s Your Visual Arts Ministry Vision? Michelle Wise on What’s Your Visual Arts Ministry Vision? SES provided by online degree tech team.